It doesn’t matter whether we’re talking ultra big gym corporations like Planet Fitness in the US, or Virgin Active in the UK, or, if we’re talking private man caves (garage home gyms) and everything in between, all should have this essential piece of equipment. I’ve long since sung the benefits of bodyweight and calisthenics based training, and I’m far from a ‘one size fits all’ guy; there’s a time and place for everything – free weights, calisthenics, machines, slow cardio, H.I.I.T. cardio and everything else – it’s your job to be astute enough to use those applicable to you. 5 SERIOUSLY challenging calisthenics movements – can you do any of these? 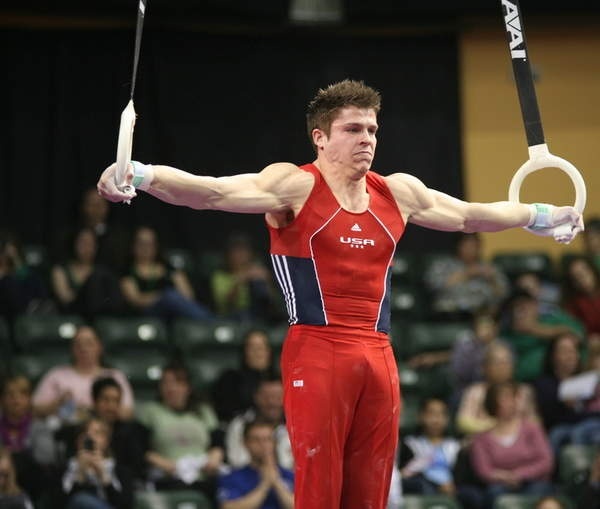 What’s so great about gymnastics rings? 1) They’re cheap and easy to assemble. My rings cost me £23.00 from Amazon. I didn’t even pay for them as I had loads of vouchers from Christmas left over! Winning. Despite their lack of cost, they are laughably easy to put up. All you need is a sturdy bar for the straps to go around and you’re there. You can even bring them with you to your local park; I’ve seen a few people doing that recently. Maybe a trend is starting? 2) They challenge you without having to add weight. Progression is the king, the god, the dictator, when it comes to results in this fitness fiasco. But progress comes in various forms. Adding weight to the bar is fine, but with the rings you can add weight without actually adding weight. Basically, you can manipulate your leverage in order to increase the resistance. Think of a regular push up on rings (which is harder than most anticipate) becoming a decline (feet elevated) fly/push up combo, where you’re bringing the arms out wider and stretching the pecs out more. Is that not a form of progressive overload? 3) They’re very ‘joint friendly’. When you use rings your joints are completely free to move as your body wishes. You’re not engrained to a fixed pattern, like you would be on a machine. Your joints are made to move and that’s why so much movement is permitted at our joints. Take pull ups for example, on a straight bar, plenty of experienced lifters have been at the mercy of wrist pain due to the lack of freedom imposed by the straight bar. When you use rings, your wrists – and shoulders, have much more freedom. The same goes for dips. Most people will find they can go much deeper on rings than they ever could on parallel bars. 4) They have great carry-over to other endeavours. The real reason everything is that bit harder on the rings is simply due to the demand of added stabilization. You have to work harder to stop the rings going where they want, which in turn recruits more overall musculature. Hence why we see ring novices shake like they’re having an attack of Parkinsons when they first give a good old fashioned push up a try. You’ll generally find whatever strength you build with ring movements, you’ll ‘double up’ on non ring exercises. For example, if you can do ring dips for a solid set of 15, you should be good for nearly 30 on the bars. It’s not a written rule, but you’ll find yourself in that ballpark. 5) Couch potato or gymnast, the rings have got you covered! Much like TRX or suspension training, the rings can be manipulated to suit any level. Take a steep incline push up, that would be ideal for someone with poor upper body strength. As they grow accustomed to that particular resistance level, you simply decrease the angle of the rings closer to vertical (reducing the incline) and you’re now lifting a greater percentage of your bodyweight. Shifting the emphasis to the lower body, we can use the rings for squatting support. Holding the rings will allow someone with restricted mobility to squat deeper while remaining more upright. Advancing things further, we could use the rings as support for pistol squat priming/practice. What about the gymnasts? Well, most of us mere mortals won’t get close to perfecting these moves as they take YEARS upon YEARS of training and practice to even get close to mastering. Two examples are The Iron Cross and The Maltese. Bridging the gap between the beginner and immensely advanced stuff will be things like pull ups, L pull ups, muscle ups, front lever variations, L sits, pike push ups, inverted rows and plenty more. Most people are blissfully unaware of the magnitude of variation that’s available thanks to the rings, which is why they’re not as popular as they should be. As it happens, I may well get some posts up which present various progression patterns for each muscle group/action. Let me know if that’s something you want to see? Previous Previous post: Maria Sharapova: A cheater or simply fighting fire with fire? Next Next post: A training concept that’s actually worth something! While I prefer barbells over bodyweight for a variety of reasons, I can’t really argue against your preference. My only objection to what you wrote is calling Planet Fitness a gym. It’s a pizza parlor and donut shop that happens to have a few pieces of workout equipment. Great business model but lousy for anyone who really wants to improve their health. I wrote that without thinking of that, I may need to edit it to ‘Gold’s Gym’. Is that a better example? I know, Planet Fitness has quite a reputation…….for all the wrong reasons. Gold’s Gym would probably be a better example, though I don’t have a lot of attraction to any of the “big box” franchise gyms. No, me neither. I work in a local gym and use my home setup for my own training. I used to be a gymnast and so I have always enjoyed doing exercise that relies on your own body weight..plus the rings are fun! And there’s no end to possible progression routes! I love the rings, I’ve not looked back since. Have you ever thought about getting back into gymnastics? Exactly, glad you enjoy the rings:) I did do a casual adults class for fun but it was a little hard on my body lol. I do mountain bike riding though now but have to be careful as I suffer with Vertigo which affects my balance. Great article! I want to buy wooden rings, it looks really fun. I saw there are 2 sizes available, 1.1 (FIG) and 1.25 inches. My hands are not huge (7,5 inches from start of wrist to top of middle finger). I tried to look online which size would fit me best and got even more confused…what would you recommend? thanks for the tips! Glad you found something useful from the post. The rings I have are 1.1 (FIG) size. I have used the thicker rings too and depending on hand size and grip/forearm strength, the 1.25s can be tougher for false grip work. My hands are around 8 inches from wrist to middle finger, as a point of reference. I’d say start with the 1.1 and if you get beastly strong, switch to the 1.25s.